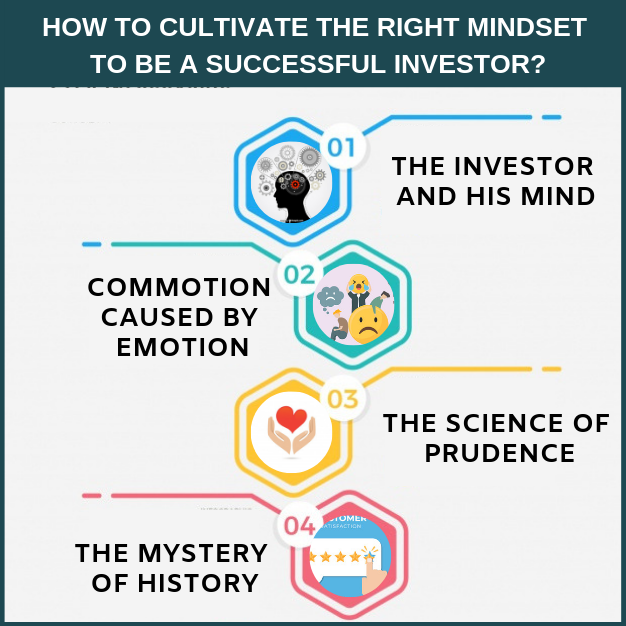 How to Cultivate the Right Mindset to be a Successful Investor? Sigmund Freud made a name for himself by interpreting dreams through the use of his knowledge of psychoanalysis. He succeeded in deciphering the various quirks inside the human brain which influenced their behavior. Had Freud tried to interpret the dreams of investors, perhaps a new dimension could have been added to the subject of investor behavior. Freud did not entirely dishearten though, he had indeed dwelt on the subject. People, over the years, have used his studies for various reasons like the exploration of the causes behind the global economic collapse and the general understanding of the subtleties of behavioural finance. Investment consultants and financial pundits have not only tried to understand the vagaries of the money market, they have also devoted considerable time and attention to investor behaviour study. Both have been equally volatile and predictably unpredictable. This article seeks to take a peek into the investor’s mind and also strives to make readers aware about those behavioral patterns which can be detrimental to their financial wealth. Emotions are an integral part of our behaviour and it is no different for investors. Emotions often lead to a situation where the investor deviates from the pragmatic route and acts contrary to their natural self. Their mood swings are influenced by greed and headstrong decisions. When things look rosy, investors’ rush in to encash the bonanzas, on the flip side, when the markets are glum, they withdraw into their shell. Another common investor behavior pattern, commonly referred to as the ‘herd behavior’, is about trying to emulate others who have made more money in the market. However, the prudent investor is one who follows the dictum of Rabindranath tagore ‘ekla chalo re’ which means that ‘… at times people have to traverse the path alone..’. These investors move ahead due to their single minded determination and aversion to being swayed by emotions. Investors who come up winners against odds tend to study the market carefully, they gather a fair idea from the signs in the market- whether investment at a particular point of time is conducive or not, if the lenders and general investors are showing eagerness and other factors like ease of entry of new funds and widths of credit spreads. ‘Too much of anything is bad’- it is said, and this perception holds for investors too. The height of both optimism and pessimism can lead to situations which can lead to monetary loss in one hand and loss of opportunities on the other hand. Financial prudence is something which cannot be quantified, it has to be observed and assessed. The economic crisis of 2008 was preceded by activities indulged in by investors which reflected high levels of risk propensity and low levels of prudence. In this context, Warren Buffet’s words reflect his wisdom “The less prudence with which others conduct their affairs, the greater the prudence with which we must conduct our own affairs”. It is not without reason that Buffet is considered to be one of the most successful investors of our times. Risk aversion is a behavioral phenomena which is not constant. It is linked to a lot of extraneous factors and investors need to carefully weigh all the options before arriving at a decision, be it a buy or sell decision. High risk aversion could result in a lot of good ‘buy’ opportunities go untouched and low risk aversion could lead to purchases which turn out to be catastrophic. “Where is the knowledge we have lost in information?”, lamented noted poet T S Eliot. This is indeed true, even Albert Einstein stated that “The only source of knowledge is experience” and “Information is not knowledge”. We often tend to miss the greater picture by directing our attention towards bits of information, which can be utterly misleading. The totality of an event can only be known by becoming aware of its history. “Those who forget their history are condemned to repeat them”- is an axiomatic statement which has been endorsed in history. The sequence of events leading to a major economic downturn can slowly fade from memory as the gap between such events sometimes span over decades. However, for a serious investor, it is imperative to remember such instances and draw from its experience and knowledge. However, the moot point remains that even though investors possess the necessary knowledge they tend to act more out of their faith and belief. What they know to be true in most cases turn out to be untrue. It is more about that fact that people believe what they want to believe and that could be anything but the truth. The devil in the mind raises its head and overshadows logic and prudence, greed takes over and leads the investor astray. Elasticity and volatility have much in common. It can stretch either way. Market volatility can reach for the stars and head towards the pit depending on the economic situation. Equities and investments in equities are a fairly recent phenomena and has been around for about 65 years or so. After a sluggish take off, equities gained momentum between 1960 and 1972 , and then again between 1982 to 1999. After its initial popularity, the inevitable happened, a plethora of equity in the market led to a saturation. Equity performances nose dived, prices reverse spiraled rapidly and the investor’s spirit took a beating leading to a loss of interest in equities. This was triggered in 2000. The situation hardly improved during the next three year period and people began to abandon equities for more secure investment options. There was a paradigm shift from the previous drive for ‘growth’ to a more sedate “safety and income” stance. Investors ignored equities between 2000 to 2003. During 2003 stock market started recovering slowly. Any thing which slowly grows will not capture the attention. Investors continue to ignore this slow growth in 2003 and 2004. Only in 2005 when stock market rised sizably, investors started noticing it and started investing in it. They have missed the initial rally in the market. Instead of swinging between safety and growth, investors need to determine an asset allocation ratio based on their risk appetite and required rate of return. They need to stick to this asset allocation ratio regardless of the crash or rise in the stock market. This will reduce their overall risk and build their wealth. If you could practice the above steps that will help you cultivate the right mindset to be a successful investor. Previous Previous post: How to Pay-off your High Cost Credit Card Debt? Next Next post: The biggest threat to your Investment Decisions and what you can do about it!